Plush crocheted stuffed animals and rattles from Pebble will delight your youngster while benefitting disadvantaged families halfway around the world. With their playful textured and striped patterns, these smile-inducing pieces make wonderful gifts or bedtime pals. Hand crocheted in 100% cotton and made to endure extra attention from your little one, these toys can be refreshed right in the washing machine. Austin Miller, one of Pebble’s founders, had been helping impoverished Bangladeshi communities promote their high-quality, handmade products throughout North America. 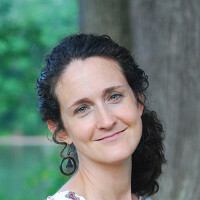 The other founder, Samantha Morshed, was committed to finding local, fair-wage work for Bangladeshi women. Often, the only viable employment is sewing garments in a distant city where the pay is meager and conditions are unsafe. Austin and Samantha joined forces and started Pebble to empower women with living-wage jobs that are close to home. The women who meticulously hand crochet each toy take pride in their work, which lets them stay involved with raising their children. The stitching is a traditional technique that machines cannot replicate. And Pebble’s life-changing mission can’t be copied, either. I'm Austin, gearing up to deliver you all the quirk and color of Pebble products. 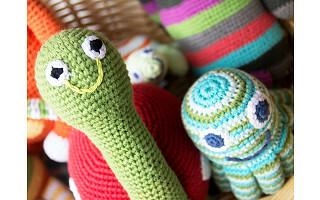 Made up of hand-knitted or crocheted toys and rattles, Pebble is not only putting smiles on faces here in the US, it provides much-needed employment to thousands of women in rural Bangladesh. I am passionate about entrepreneurial solutions to alleviating poverty wherever it exists. I look forward to answering your questions. Hi. I am actually interested in your organizational structure as a company that helps empower Bangladesh women by enabling them to sell their handmade crafts- I am trying to set up my own small nonprofit program to do the same sort of thing for local impoverished women. Would you mind explaining how your organization is set-up to allow for the production and sale of the items, as well as how you designed the monetary benefit distribution so that the structure is sustainable, but also allows the women to make a working wage? I also would love to know some of the places/ways you sell the items, such as Grommet. THANK YOU!!! So glad to hear that you're interested in hearing more. Let's try to get you connected to Austin directly so he can best tell you more. Stay tuned. Hathay Bunano's manufacturing structure is explored in depth in a case study done for the MIT Innovations Journal. It is entitled: Reducing Poverty by Employing Young Women: Hathay Bunano’s Scalable Model for Rural Production in Bangladesh. As the US Distributor for Pebble we have the unique position of having lived in Bangladesh and having seen first-hand the impact the Hathay Bunano is making in women's lives and we find that this is compelling for an increasing number of customers who want their purchases to have some sort of social impact. Before starting a non-profit I would also weigh the possible benefits of setting up your enterprise as a for-profit social enterprise, perhaps as a B-Corp.
Feel free to contact me for more specific questions. I would say "Definitely not!" but then again I am not a Mom and can't to hear what other moms say. • I have a 10-year old son who asks for some of the Pebble items. • We have college-aged 'kids" that buy them for their dorm room. • We find that even Pebble's rattles outlive the usual age spectrum that you would place them in developmentally. When I think back, I believe that if my favorite uncle would have given me a rock, I would probably still be hanging on to it. "can't wait to hear what other moms say" rather. @Austin thanks, will wait to hear from a mom or two, they are the best for info as well! I am a mom and grandmom and I can tell you that my grand kids ages 6 to 21 all love this stuff my adult children have some fav's to .. I don't think age is an issue here handmade stuffies are ageless..
@Jessie, @Christoper & @Austin -- Moms do know quite a lot! I agree with Jessie that handmade stuffies are ageless. I probably wouldn't recommend one of the Pebble rattles for your 5 year old niece, just because rattles are traditionally considered for infants or toddlers, but the stuffed animals are perfectly precious at any age. Plush crocheted stuffed animals and rattles from Pebble will delight your youngster while benefitting disadvantaged families halfway around the world. 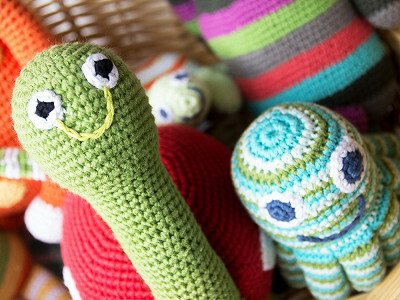 With their playful textured and striped patterns, these smile-inducing pieces make wonderful gifts or bedtime pals. Hand crocheted in 100% cotton and made to endure extra attention from your little one, these toys can be refreshed right in the washing machine. Austin Miller, one of Pebble’s founders, had been helping impoverished Bangladeshi communities promote their high-quality, handmade products throughout North America. The other founder, Samantha Morshed, was committed to finding local, fair-wage work for Bangladeshi women. Often, the only viable employment is sewing garments in a distant city where the pay is meager and conditions are unsafe.